Port Adelaide has turned a 26point half time deficit into a 26-point victory with 12.0 (72) to 3.2 (26) in the second half. After half time the Power recorded 70 more disposals, four extra clearances and six fewer turnovers than the Crows. Make that 12 goals without a miss this half, with six launched from midfield clearances to the Power. Patrick Ryder has been dominant in the ruck in this time with nine hit outs to advantage, five of which have launched possession chains ending in goals. That's now 11 goals without a miss to Port Adelaide in the second half. In this period the Power have won 20 midfield clearances, launching five resulting goals from this source. The Crows have managed just one goal from 15 midfield clearances. 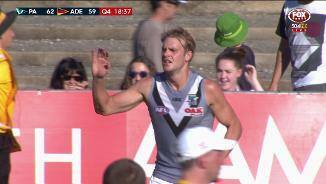 Port Adelaide has now kicked ten goals in the second half without a behind, with the goal to Dougal Howard just the third not from a set shot. The Power has been helped with four goals from the goal square, while the Crows have not managed any. Since half time Port Adelaide has dominated field position, with 60 per cent time inside their forward half. In that time the Power have won 11 forward half intercepts and launched goals from four of them, while the Crows have won four for just one goal. Jack Watts now has a half dozen in a shining performance. Since the Crows led by 14 points after 15 minutes of the first quarter, the Power has won 87 more uncontested possessions than the Crows, including 54 more uncontested marks. ExKangaroo Sam Gibson continues the trend of new club arrivals hitting the scoreboard, cutting the Power's lead to three points. That marked just the tenth forward 50 entry for Adelaide in the second half, after it did so 29 times in the first half. 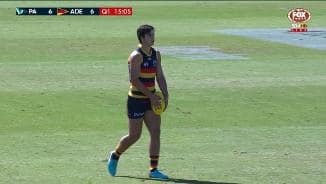 Adelaide Crows InterchangeRory Sloane off due to an injury. Jack Watts has clearly been the best forward on the ground with five goals from eight kicks and five shots. The exDemon has taken three marks inside forward 50, with two taken in marking contests. After Adelaide has spent over 81 minutes in front, Port Adelaide now takes the lead with its sixth goal of the quarter. The Power have had 29 more uncontested possessions than the Crows this term and 22 per cent extra time in possession. The Power's ability to intercept in the air has been a feature of its defensive efforts. Port Adelaide has taken 15 intercept marks, led by Tom Clurey (four) and Dougal Howard (three). Adelaide has managed just eight intercept marks. Port Adelaide InterchangeJasper Pittard off due to an injury. Port Adelaide has capitalised on the miss by Eddie Betts, transitioning the resulting kick in to a goal for Sam Gray at the opposite end. In 2017 the Power averaged a score launched from 7.5 per cent of kick ins, ranked just 14th in the league. Bryce Gibbs answers Watts with his second goal, as both players impress in new colours this season. His kick for goal marked just the third effective kick for the Crows in their forward half so far this quarter. That's four unanswered goals within the first ten minutes for the Power! Jack Watts has four goals for his new club, a career best for him in preseason matches. Three of Port Adelaide's four goals this term have been launched from midfield clearances. The Power's ball use is a class above that of the Crows this term, as they kick their third goal launched from the resulting centre clearance. Port Adelaide's kicking effectiveness is 74 per cent for the quarter, well above Adelaide at just 30 per cent. Port Adelaide has made the cleaner start to the second half. Although the Crows have won both centre clearances, they have committed eight turnovers in 18 disposals. The Power have capitalised, taking the ball inside 50 five times for two majors. Chad Wingard has played an important role for the Power through the midfield but has kicked his first major with his first disposal inside forward 50. He has recorded 13 disposals and two centre clearances, as well as 286 metres gained (a team high). Adelaide's three goals to end the quarter has blown this game open at half time. 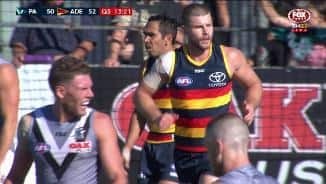 In the last 11 minutes of the half the Crows showed their dominance, with 28 per cent extra time in possession than the Power leading to three goals from five inside 50s. Rory Sloane has had a strong half, capped off with his first major. Adelaide's acting captain has recorded 14 disposals and won four clearances, two of which have launched goals. Last year Sloane kicked a careerbest 20 goals for the season. Darcy Fogarty has taken four marks inside forward 50 before half time, two better than any other player has managed in a JLT Community Series match so far this year. The young Adelaide forward has kicked 3.1 (19) from four shots. Port Adelaide InterchangeSam Gray off due to an injury. Rory Atkins has been creative with ball in hand, with seven kicks at 86 per cent effectiveness from his nine disposals. He has now delivered inside forward 50 on two occasions and has been involved in four possession chains ending in a score. Power defender Dougal Howard has showed resilience in defence, taking a gamehigh eight marks (including three from intercepts). He is keeping it simple with ball in hand, as all of his 12 disposals have been kicks at 92 per cent effectiveness. 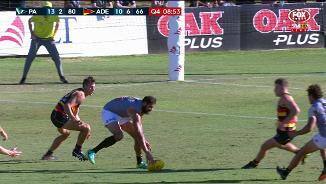 Port Adelaide is attempting to control possession in its ball movement via precise foot skills. The Power have recorded 27 more short kicks than the Crows across the match, while the Crows have opted for 12 more handballs. It's goal for goal at Alberton Oval as Jack Watts kicks his second major. Three of the Power's four goals have come in play, compared to the Crows who have kicked all but one from set shots. That's now three of Adelaide's five goals kicked from outside 50 metres, after Bryce Gibbs does it easily on the run in his new colours. Last season the Crows kicked 33 goals from outside the arc in the Home and Away season, ranked fourth in the league. Adelaide takes a sevenpoint lead to the first break at Alberton Oval. The Crows were superior in the midfield, getting first hands on the ball via six more clearances than the Power. All six of Adelaide's scores were launched from the midfield zone. In the past ten minutes the Power have been able to steady around the ground, winning two more clearances than the Crows. This has allowed Port Adelaide to control possession, recording 20 extra uncontested possessions in that time. Adelaide has kicked its last three goals from shots following marks. The Crows are enjoying most of the play forward of centre, with 64 per cent of the quarter played inside their forward half. Port Adelaide has capitalised twice now on Adelaide's turnovers coming out of defence, kicking both goals from forward half intercepts. Last year the Power averaged 37 points per game from forward half intercepts (ranked second in the league). Darcy Fogarty has kicked a minor score after two set shots sailed through from outside 50 metres. In the Crows' JLT Community Series win over the Dockers, Fogarty recorded just one kick (for a goal) in his 64 minutes played. Adelaide now leads by a goal after 2017 National Draft 12th selection Darcy Fogarty kicks its second. The Crows have dominated around the ball, winning all five clearances and recording 23 more disposals than the Power. Adelaide has struck first with McGovern converting from its first forward 50 entry, following a free kick. 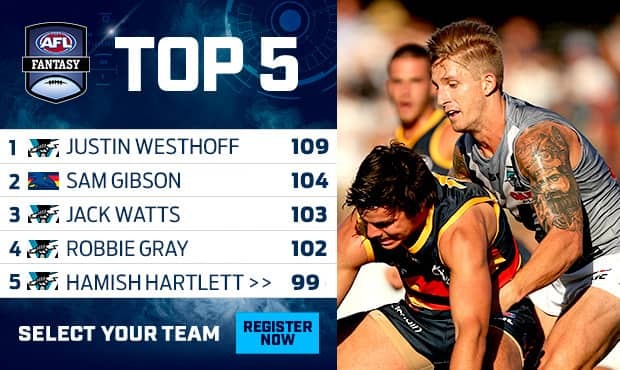 Last season the Crows were ranked second in the league for scores per inside 50 (50.1 per cent) and first for goals per inside 50 (27.5 per cent). Last week against Fremantle, Adelaide conceded four extra clearances and was outscored by 10 points from that source. However in 2017 the Crows were ranked fourth in clearance differential (plus 1.6 per game) and scores from clearances (plus 5.7 points). Against West Coast last week, Port Adelaide spent 16 minutes longer in its defensive half than the Eagles. In 2017 the Power was the league's best team in controlling field position, averaging seven more minutes in their forward half than its opponents. 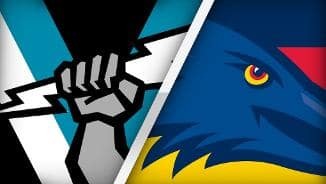 Port Adelaide and Adelaide have met in 11 previous preseason matches stretching back to 1999, with Adelaide winning seven games (including the last five). Similarly, the Crows have also won their past five regular season games against the Power. Welcome to Alberton Oval for the Port Adelaide v Adelaide Crows Round 2 clash. PORT Adelaide recruit Jack Watts has won over the Power faithful with an outstanding six-goal haul in the club's final hit-out before the start of the home and away season. 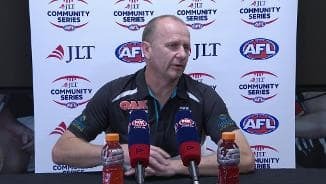 Watts – often maligned during his 153 games at Melbourne - looked right at home in his new surroundings as he spearheaded a 26-point victory against cross-town rivals Adelaide in their JLT Community Series encounter at Alberton Oval on Saturday. Trailing by 26 points at half time, the Power turned the game on its head with 12 goals straight to three, en route to winning 16.2 (98) to 11.6 (72). "We're practicing and we're trialling and we're working with different stuff," Power coach Ken Hinkley said. "We tried a couple of different things in both halves of the game and in the second half, we got to play the game we'd like to play." Highly-rated youngster Darcy Fogarty was a standout for the Crows, the 18-year-old booting three first-half goals to rocket into round one calculations, especially if captain Taylor Walker can't recover in time from a foot injury. Experienced winger Sam Gibson looks to have booked a round one berth for his new club after 27 possessions, while Matt Crouch (23), Rory Laird (23) and Rory Atkins (21, two goals) were busy. 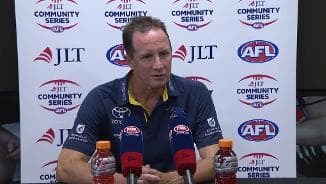 "At half time, we were playing some good footy, I thought we were not only attacking and moving the ball pretty well, but we were defending the game pretty well," Crows coach Don Pyke said. "In the second half, we went away from some of the things that worked for us in the first half. "It's probably a nice, gentle reminder if we drift away from those things, like any footy team, you're going to be under the pump a little bit." The Power relished the sweltering 34-degree heat, running the game out the better of the two sides to the delight of the 6,157-strong crowd at their traditional home. Watts was the star of the afternoon, kicking six goals straight from 17 disposals and five marks. 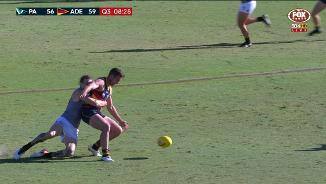 Pittard grabbed his right hamstring when attempting to tackle Crows winger Rory Atkins at the eight-minute mark of the third quarter. Power speedster Aidyn Johnson (illness) and Crows forward Harry Dear (omitted) dropped out of their respective squads before the game. Port Adelaide: The Power's forward structure, which was one of their downfalls last year, looks a lot better with Jack Watts alongside Charlie Dixon. Watts gives another genuine tall target who can beat his opponent one-on-one. Steven Motlop showed his pace and dash through the midfield. Adelaide: The Crows were unable to turn the tide once the Power got on a roll. It was the same situation that happened to them on several occasions last year. They need to be able to find a way to right the ship and get back on course when the opposition get the upper hand. 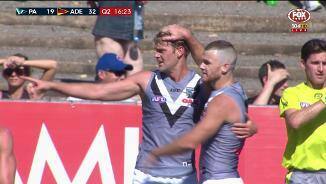 Port Adelaide: Jack Watts impressed playing alongside Charlie Dixon in the Power's forward line, booting six goals and showing his strength one-on-one. Ex-Geelong speedster Steven Motlop provided dash across half-forward and through the midfield. Dom Barry was quiet on the wing. Former Gold Coast defender Trent McKenzie didn't play the first half, but racked up 10 disposals in the second to put himself in the mix for round one as a possible replacement for the injured Jasper Pittard. Adelaide: Darcy Fogarty put himself firmly into round one calculations with a superb performance, the No.12 overall pick in last year's draft booting three goals in the first half and leading superbly. At the other end of the age spectrum, 31-year-old Sam Gibson – recruited from North Melbourne during the trade period - found plenty of the ball on the wing. Bryce Gibbs didn't have the same impact as his first game for the club, but still did some nice things. Tom Doedee looked good at times, while small forward Lachlan Murphy applied pressure in the forward half and ran hard. Both are chances to debut in round one. The Power will aim to take their winning momentum into their season-opener against Fremantle at Adelaide Oval on Saturday, March 24 at 4.05pm (ACDT). The Crows take on Essendon at Etihad Stadium on Friday, March 23, at 7.50pm (AEDT).